This time of year is just so fun! Summer will always be our happy place, but Fall just makes us giddy. From football to apple picking to our personal favorite fall activity - HALLOWEEN! For months now our kids have been grabbing every costume themed catalog out of the mail that they can. They spend hours pouring over each page, circling all their favorites until they decide exactly what they want to be for the big day. Sometimes take on the challenge to make the costumes, and other years we opt to just go ahead and make their spooky dreams come true straight from the pages of their copious circling. 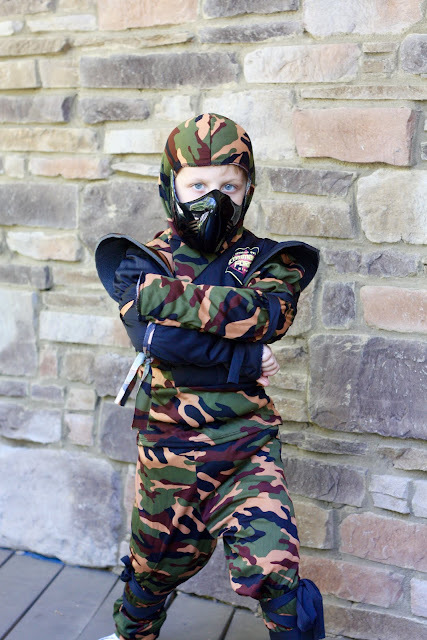 This year Boo-Boo set his sights on being a ninja, and not just any ninja - a camo ninja! As he was looking through the Oriental Trading catalog he spotted this costume and deemed it perfect for this year's Halloween festivities. Who knew such a thing even existed? Checking at least one costume off our list, we happily clicked "add to cart", and within just a few days his camo ninja costume was on our doorstep. 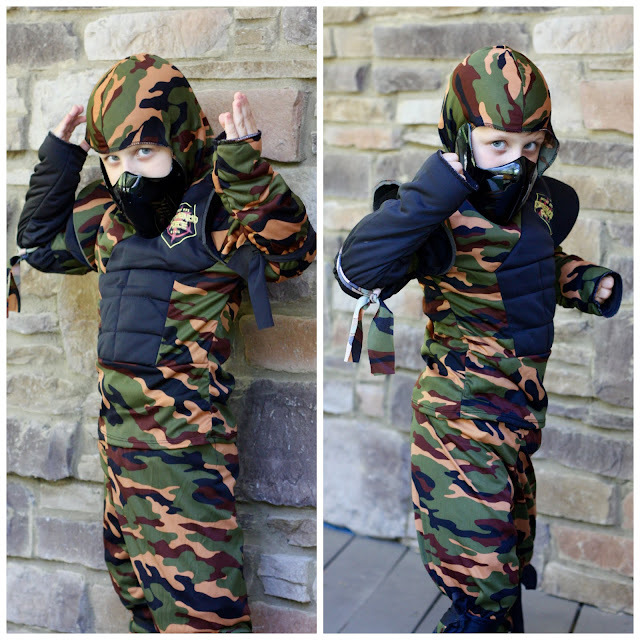 He couldn't wait to put it on and show off all of his awesome ninja moves. The nice thing about ordering his costume from Oriental Trading this year, was that we were able to go ahead and get our order going as well for all of our Halloween activities. With six children between us that's at least six costumes and at least five classroom parties, plus any celebrations they might have at their after school activities, in the neighborhood, at playgroup, and maybe throw in an adult party or two. You get the idea - it can add up! Oriental Trading has such a great selection of Halloween items that it literally is a one-stop shop for all the things we need. Once the kids are done with their catalog circling, we usually take a peek at the catalog ourselves to start making a Halloween party prep list. From candy options (or even non-candy options) to spooktacular table decor they have everything we could possibly need to be prepared for Halloween. This year is Little Cute's first official class party, and in our planning we thought it would be fun to set up a spooky little luncheon to host after her costume parade. Our excitement might have rivaled Boo-Boo's when we opened our box to see all of the fun Halloween goodies in person. 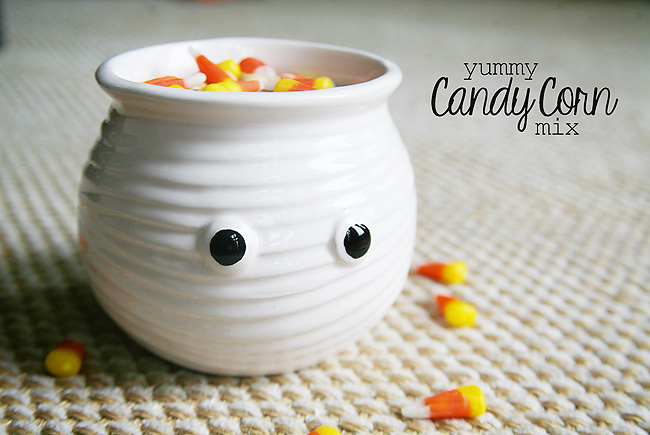 Those little disposable ghost cups might be the cutest thing ever! We put everything together just to make sure it would work with what we have in mind. We can't wait to see the kids faces. This age is so fun and they will be so thrilled when they see their spooky set up. We decided to throw in a little something extra to each place setting just to give the party a little added fun. When we spotted these fun Halloween sunglasses in the catalog, and just knew it would make for the perfect Halloween party favor. The kids have already had fun testing them out, but we know that L.C. and her classmates will have a good giggle when they each wear their "ghost goggles" during the party. We whipped up this printable and attached it to each pair to complete the table setting. Simple and easy, and the perfect way to top off the party! 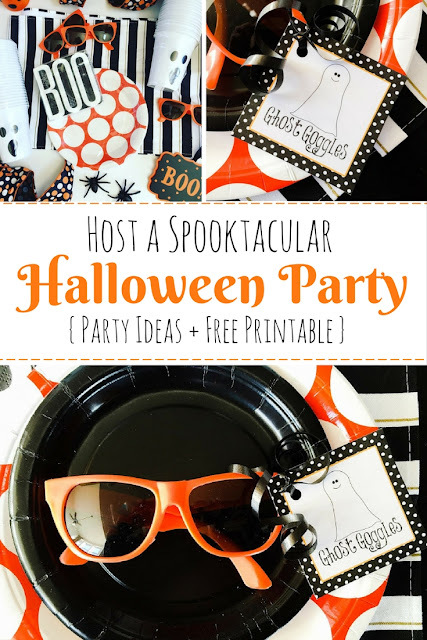 Between the costumes, "ghost goggles", party decor, and a few fun treats and activities we've sourced from the Oriental Trading's sister site Free-N-Fun (which is an ah-mazing resource that you totally need to check out! ), we feel beyond prepared for a spook-tacular Halloween party season. Be sure to check out Oriental Trading's coupon page for the latest deals! Now to let the countdown officially begin to all things spooky! What events do you have planned this Halloween season? Download the GHOST GOGGLES printable.